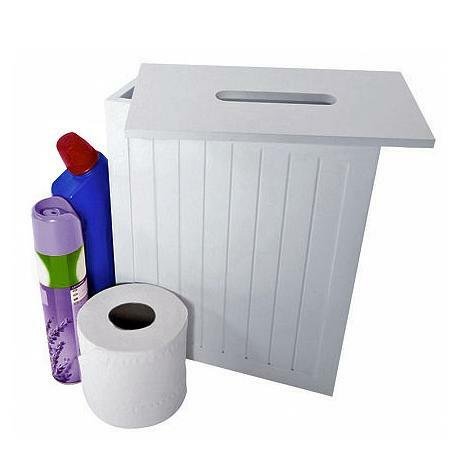 Keep all those unattractive bathroom accessories such as toilet spray and toilet rolls hidden in this attractive and compact white MDF shaker style storage unit. White shaker style multipurpose bathroom store. Ideal for storing cleaning bottles, toilet rolls and other accessories. Perfect size for bathroom cleaning products. Nice quality at a decent price. Very easy to assemble. Great little storage unit for keeping small items in very pleased. The unit is exactly what I was looking for. I can only make it hold 2 toilet rolls as well as air freshener and toilet cleaner (my toilet rolls must be bigger?!) however that's not a complaint, just an observation.Easy to put together and keeps everything tidied away.Perhaps a little pricey for what it actually is, especially with postage but that would be my only minor gripe. This was exactly what I was looking for, a small neat container, fits 6 loo rolls, or 3 with bleach!